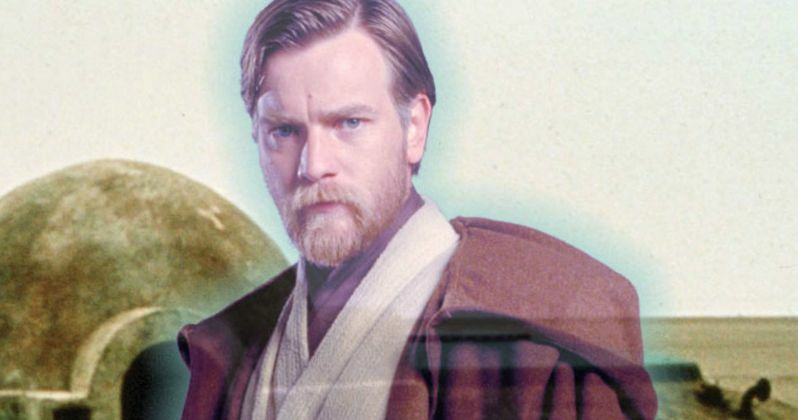 A few years ago, rumors surfaced that LucasFilm is developing a spin-off trilogy that will center on Obi-Wan Kenobi, set between Revenge of the Sith and A New Hope. That report was never confirmed by LucasFilm, but Ewan McGregor, who played Obi-Wan Kenobi in the prequel trilogy, has expressed interest in reprising his iconic role once again. Today we have another unconfirmed report that reveals there is a good reason why LucasFilm isn't ready to move forward with any Obi-Wan spin-offs yet, because he may return in either Star Wars 8 or Star Wars 9. Entertainment Weekly's Anthony Breznican recently conducted in interview with Rebel Force Radio, when the talk ultimately shifted to the long-rumored Obi-Wan spin-off. There have also been no shortage of rumors that claim Rey (Daisy Ridley) is related to Obi-Wan Kenobi, but nothing has been confirmed. When asked about the possibility of an Obi-Wan Kenobi spin-off, Anthony Breznican teased that he has heard LucasFilm may bring this iconic character back for one of the upcoming Saga films, Star Wars 8 or Star Wars 9. Here's what he had to say below. "Um, I have heard rumors that the one reason they haven't moved sooner on Obi-Wan is that they're not done with Obi-Wan quite yet in the Saga films. So I wouldn't be surprised to see an Obi-Wan thing happen beyond Episode IX. Which it would have to anyway, because they're booked up until Episode IX." You may recall that Ewen McGregor did provide the voice of Obi-Wan for one line in Star Wars: The Force Awakens, while a recording of the late Alec Guinness saying "Afraid" as Obi-Wan in the original trilogy, was edited to say "Rey," along with Ewen McGregor's line, "these are your first steps." While it hasn't been confirmed if Obi-Wan will be seen or heard in Star Wars 8 or not, Anthony Breznican speculates that there will certainly be some reference to Obi-Wan in the next two Saga films. Here's what he had to say below. "So I don't think that's controversial to say, but I think that there's bound to be some reference to Obi-Wan - and I'm not being coy here, this is literally all I know is that [Lucasfilm's thinking is] 'Ehh, if you want to tell an Episode IX story, it's better that it happens after this first trilogy, because things that happen in it can maybe reference The Force Awakens trilogy,' if that makes any sense. Some of this is sort of like doing CIA spywork, where you get little pieces of information and then you try to connect them. But I think that they'll probably be some reference to Obi-Wan in the Saga films, and his connection to whatever characters he happens to have a connection with. I've already written that I think that Rey has some kind of connection to him - family connection. So if that's the case, maybe we see a part of that play out in the future Obi-Wan movie. Ewan McGregor would be the perfect age to reprise that [character]. So he seems game to do it, and I thin [the movie] hasn't been one they've greenlit just yet, but partly because they're still shaping that story. So we'll see. I think it's - again - kind of a no-brainer." We reported earlier today that the first trailer for Star Wars: Episode VIII will debut at some point in the first quarter of 2017, but an exact date has not been given quite yet. LucasFilm still hasn't given a specific release date for Star Wars: Episode IX quite yet, but we know that Colin Trevorrow will be writing and directing that final adventure in this new trilogy. Hopefully LucasFilm and Disney will reveal their plans for Obi-Wan Kenobi in the near future.